Secondly, after four years of Brussels-imposed bureaucratic delays, Russia is free to go ahead with the construction of two new reactors at Paks, the vast Warsaw Pact-era nuclear power plant that produces most of Hungary’s energy. Funded primarily with Russia’s own money – in the form of a €10 billion loan – the project brings obvious benefits to both sides, and discussions will focus on dates, rather than any existential questions. Preliminary site work on the first reactor began earlier this year despite continuing legal challenges, with the two reactors scheduled to become operational in the middle of the next decade. The partnership that dare not speak its name? For Putin, Hungary is probably Russia’s best chance to be heard in Europe. The Austrian government, whatever the fruits of ‘wedding invite diplomacy,’ is wary of being caricatured as the Kremlin’s Trojan Horse (indeed it is Vienna that is currently trying to block the Paks project, due to its own anti-nuclear stance). On the other hand, Orban has ruled Hungary since 2010, and has just scored another resounding win. The Hungarian prime minister has repeatedly advocated the dropping of sanctions against Moscow, introduced over Crimea four years ago. 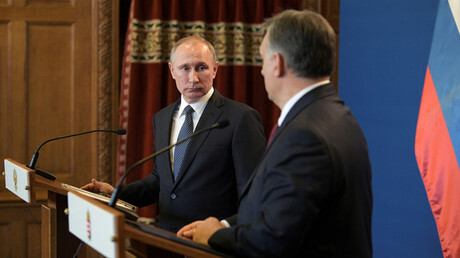 For Moscow, currying influence with Orban has no downsides – other than having to signal its friendliness with financial incentives. While four-fifths of Hungary’s trade is with the EU, its trade volume with Russia rose by a quarter in 2017. Being a much bigger economy, Russia can afford the hit, and in most cases economic cooperation with Budapest would be a win-win for both countries anyway. For Orban, the calculus is harder. While his “illiberal democracy” policy is part provocation against Brussels, the country remains one of the biggest beneficiaries of European funds in relative terms. It is a member of NATO, and stood alongside other EU nations during the Skripal expulsions. On the other hand, Orban will be swayed by any tangible benefits offered to Russia. An internationally underrated aspect of his government’s success is its stellar economic performance – it has consistently outpaced the sluggish EU growth rates, with the economy predicted to expand by over 4 percent in 2018. Guaranteeing energy security for decades ahead through cooperation with Moscow is a tempting option for Orban. But in the end, the results of the Putin talks will hinge not on numbers, but courage. For its part, Moscow is always going to be open to a quid-pro-quo with Budapest. But is Orban ready to withstand the heckles that will come his way from Brussels and elsewhere in Europe for working with Putin? And will foreign pressure push Orban and Putin closer together, or force them apart? Tuesday can begin answering these questions, though any signs of closeness between the two leaders may come through anodynely-worded statements, rather than love sonnets performed in public.